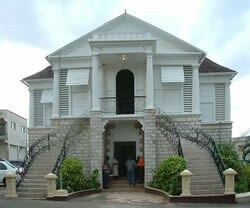 The Mandeville Court House was built in 1817. 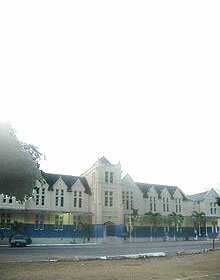 It was constructed in the Jamaica Georgian style with two storeys, the top floor having columns, louvers and sash windows. A double spiral staircase leads from the lower storey on to a portico and the top storey. Limestone blocks were used to build the court house. The original structure has not been changed over time and is still used as a court house with supporting offices on the premises. 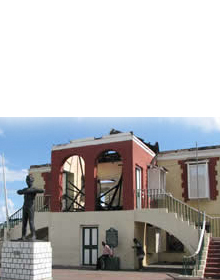 The court house is actually the oldest building in the Mandeville Square, having been erected only two years after the town had been incorporated in 1815. 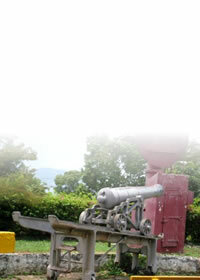 Slave labour was used in the construction of this bastion of justice. The lower storey was used as the first school house during the early days of the town. In 1955, while on tour of the southern parishes, Princess Margaret was officially welcomed to the parish of Manchester, at the court house.